Dionysius Areopagiticus ("the Areopagite"), named in Acts 17:34 as one of those Athenians who believed when they had heard Paul preach on Mars Hill. Beyond this mention our only knowledge of him is the statement of Dionysius, bishop of Corinth (fl. 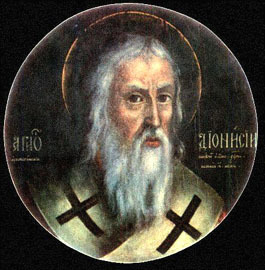 AD 171), recorded by Eusebius, that this same Dionysius the Areopagite was the first "bishop" of Athens. Some hundreds of years after the Areopagite's death, his name was attached by the Pseudo-Areopagite to certain theological writings composed by the latter. These were destined to exert enormous influence upon medieval thought, and their fame led to the extension of the personal legend of the real Dionysius. Hilduin, abbot of St. Denys (814-840), identified him with St. Denys, martyr and patron saint of France. In Hilduin's Areopagitica, the Life and Passion of the most holy Dionysius, the Areopagite is sent to France by Clement of Rome, and suffers martyrdom upon the hill where the monastery called St. Denys was to rise in his honor. There is no earlier trace of this identification, and Gregory of Tours (d. 594) says that St. Denys came to France in the reign of Decius (AD 250), which falls about midway between the presumptive death of the real Areopagite and the probable date of the writings to which he owed his adventitious fame. Traces of the influence of these writings appear in the works of Eastern theologians in the early part of the 6th century. They also were cited at the council held in Constantinople in 533, which is the first certain dated reference to them. In the West, Gregory the Great (who died in 604) refers to them in his thirty-fourth sermon on the gospels. They did not, however, become generally known in the Western church until after the year 827, when the Byzantine emperor Michael the Stammerer sent a copy to Louis the Pious. It was given over to the care of the above-mentioned abbot Hilduin. In the next generation the scholar and philosopher Johannes Scotus Erigena translated the Dionysian writings into Latin. This appears to have been the only Latin translation until the 12th century when another was made, followed by several others. Thus, the author, date and place of composition of these writings are unknown. External evidence precludes a date later than the year 500, and the internal evidence from the writings themselves precludes any date prior to 4th-century phases of Neo-Platonism. The extant writings of the Pseudo-Areopagite are: (a) Concerning the Celestial Hierarchy, in fifteen chapters. (b) Concerning the Ecclesiastical Hierarchy, in seven chapters. (c) Concerning Divine Names, in thirteen chapters. (d) Concerning Mystic Theology, in five chapters. (e) Ten letters addressed to various worthies of the apostolic period. Although these writings seem complete, they contain references to others of the same author. But of the latter nothing is known, and they may never have existed. The writings of the Pseudo-Areopagite are of great interest, first as a striking presentation of the heterogeneous elements that might unite in the mind of a gifted man in the 5th century, and secondly, because of their enormous influence upon subsequent Christian theology and art. Their ingredients -- Christian, Greek, Oriental and Jewish -- are not crudely mingled, but are united into an organic system. Perhaps theological philosophic fantasy has never constructed anything more remarkable. The system of Dionysius was a proper product of its time -- lofty, apparently complete, comparable to the Enneads of Plotinus which formed part of its materials. But its materials abounded everywhere, and offered themselves temptingly to the hand strong enough to build with them. There was what had entered into Neoplatonism, both in its dialectic form as established by Plotinus, and in its magic-mystic modes devised by Iamblichus (died circa 333). There was Jewish angel lore and Eastern mood and fancy; and there was Christianity so variously understood and heterogeneously constituted among Syro-Judaic Hellenic communities. Such Christianity held materials for formula and creed; also principles of liturgic and sacramental doctrine and priestly function; also a mass of popular beliefs as to intermediate superhuman beings who seemed nearer to men than any member of the Trinity. Out of this vast spiritual conglomerate, Pseudo-Dionysius formed his system. It was not juristic -- not Roman, Pauline or Augustinian. Rather he borrowed his constructive principles from Hellenism in its last great creation, Neo-Platonism. That had been able to gather and arrange within itself the various elements of latter-day paganism. The Neo-Platonic categories might be altered in name and import, and yet the scheme remain a scheme; since the general principle of the transmission of life from the ultimate Source downward through orders of mediating beings unto men, might readily be adapted to the Christian God and his ministering angels. Pseudo-Dionysius had lofty thoughts of the sublime transcendence of the ultimate divine Source. That source was not remote or inert; but a veritable Source from which life streamed to all lower orders of existence -- in part directly, and in part indirectly as power and guidance through the higher orders to the lower. Life, creation, every good gift, is from God directly; but his flaming ministers also intervene to guide and aid the life of man; and the life which through love floods forth from God has its counterfiow whereby it draws its own creations to itself. God is at once absolutely transcendent and universally immanent. To live is to be united with God; evil is the nonexistent, that is, severance from God. Whatever is, is part of the forth-flowing divine life which ever purifies, enlightens and perfects, and so draws all back to the Source. The transcendent Source, as well as the universal immanence, is the Triune God. Between that and men are ranged the three triads of the Celestial Hierarchy: Seraphim, Cherubim and Thrones; Dominations, Virtues, Powers; Principalities, Archangels, Angels. Collectively their general office is to raise mankind to God through purification, illumination and perfection; and to all may be applied the term "angel." The highest triad, which is nearest God, contemplates the divine effulgence, and reflects it onward to the second; the third, and more specifically angelic triad, immediately ministers to men. The sources of these names are evident: seraphim and cherubim are from the Old Testament; later Jewish writings gave names to archangels and angels, who also fill important functions in the New Testament. The other names are from Paul, in Ephesians 1:21 and Colossians 1:16. Such is the system of Pseudo-Dionysius, as presented mainly in The Celestial Hierarchy. That work is followed by The Ecclesiastical Hierarchy, its counterpart on earth. What the primal triune Godhead is to the former, Jesus Christ is to the latter. The Ecclesiastical Hierarchy likewise is composed of Triads. The first includes the symbolic sacraments: Baptism, Communion, Consecration of the Holy Chrism. Baptism signifies purification; Communion signifies enlightening; the Holy Chrism signifies perfecting. The second triad is made up of the three orders of Bishops, Presbyters and Deacons, or rather, as the Areopagite names them: Hierarchs, Light-bearers, Servitors. The third triad consists of monks, who are in a state of perfection, the initiated laity, who are in a state of illumination, and the catechumens, in a state of purification. All worship, in this treatise, is a celebration of mysteries, and the pagan mysteries are continually suggested by the terms employed. The work Concerning the Divine Names is a noble discussion of the qualities which may be predicated of God, according to the warrant of the terms applied to him in Scripture. The work Concerning Mystic Theology explains the function of symbols, and shows that he who would know God truly must rise above them and above the conceptions of God drawn from sensible things. The works of Pseudo-Dionysius began to influence theological thought in the West from the time of their translation into Latin by Erigena. Their use may be followed through the writings of scholastic philosophers, e.g. Peter Lombard, Albertus Magnus, St. Thomas Aquinas and many others. In poetry we find their influence in Dante, Edmund Spenser, John Milton. The fifteenth chapter of The Celestial Hierarchy constituted the canon of symbolical angelic lore for the literature and art of the middle ages. Therein the author explains in what respect theology ascribes to angels the qualities of fire, why the thrones are said to be fiery; why the seraphim are burning as their name indicates. The fiery form signifies, with Celestial Intelligences, likeness to God. Dionysius explains the significance of the parts of the human body when given to celestial beings: feet are ascribed to angels to denote their unceasing movement on the divine business, and their feet are winged to denote their celerity. He likewise explains the symbolism of wands and axes, of brass and precious stones, when joined to celestial beings; and what wheels and a chariot denote when furnished to them -- and much more besides.